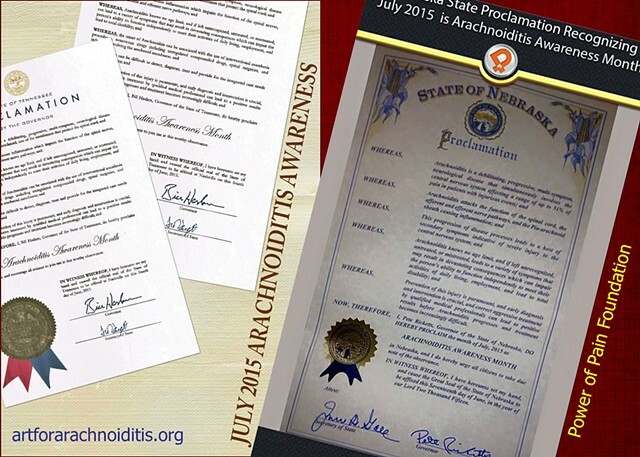 The FIRST Arachnoiditis Awareness month is being observed in Arizona, Tennessee, Nebraska, Oklahoma, and Indiana. The Art For Arachnoiditis Project continues to work to promote awareness for the sake of prevention. The Power of Pain Foundation is keeping a record of these Proclamations. Becoming a POPF Delegate will give you additional opportunities to raise awareness, empower yourself and other patients, host local events, be interviewed for media, and participate in advocacy efforts. Apply here.